WHAT IS A CENTURY AWARD? Century Awards are sponsored by the Dressage Foundation. They honor a dressage ride at any level in a schooling show or a licensed show for which the sum of the rider's age and the horse's age is 100 or more. Click here for further information. Congratulations to Estelle Beemer (76) and Atticus Rocks (24) for completing their century ride at FEI Prix St Georges. The pair rode Sunday, March 25, 2018 at FADS at Wyndham Oaks in Boyds, MD. Estelle began riding as a child in California, trying both English and Western. Her strong inclination was for jumping. While at college at George Mason University, she followed that dream and began jumping in earnest. The world of jumping eventually brought her to the Potomac Horse Center in Gaithersburg, MD. There she was influenced by British Horse Master Betty Howett to try this new sport, dressage. 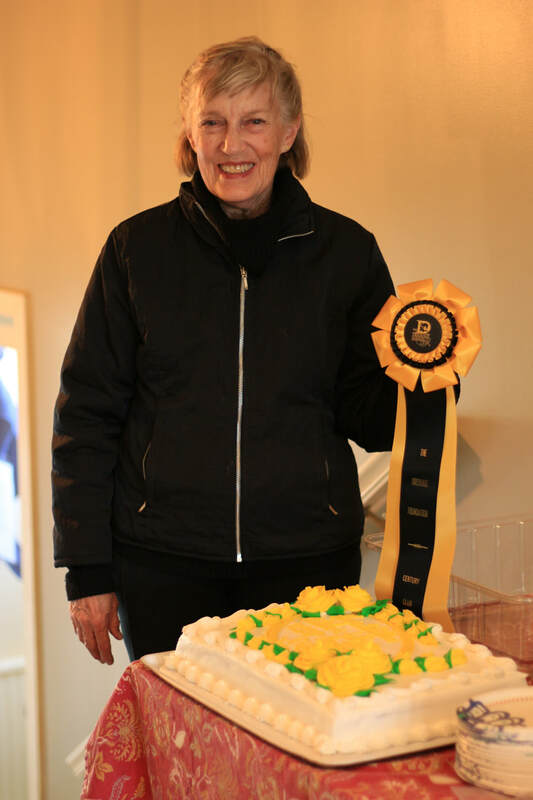 Estelle was part of the Potomac Horse Center group that formed the Potomac Valley Dressage Association, our nation’s second oldest USDF Group Member Organization. She also served on PVDA’s first board of directors in 1965. Estelle has always enjoyed training her own horses up through the levels. So, in 2002, when she began her search for a new horse, she put a premium on calm temperament as well as athleticism. She found an 8 year old Percheron/TB cross who had primarily done trail riding, and the partnership between Estelle and Atticus Rocks (Atticus) was formed. It didn’t matter to Estelle that it took two months to teach this trail horse to pick up the right lead canter. Estelle was up for the challenge. With only once a week lessons with trainer Cheryl Ann Loane, Estelle took Atticus from trail horse to FEI horse. She diligently crossed trained with cavelleti and hill work and gradually brought Atticus up through the levels. Flying changes were a particular sticking point, but two years of persistence paid off and Atticus does wonderful tempi changes and is currently schooling one tempis. Life is not without setbacks. Estelle had a long layup with a broken leg. Atticus had a year layup from a collateral ligament injury. But this team has been resilient through every setback, and they are not done yet. Atticus does a solid passage and is schooling piaffe and one tempis. Don’t bet against Estelle and Atticus showing Grand Prix in their future! 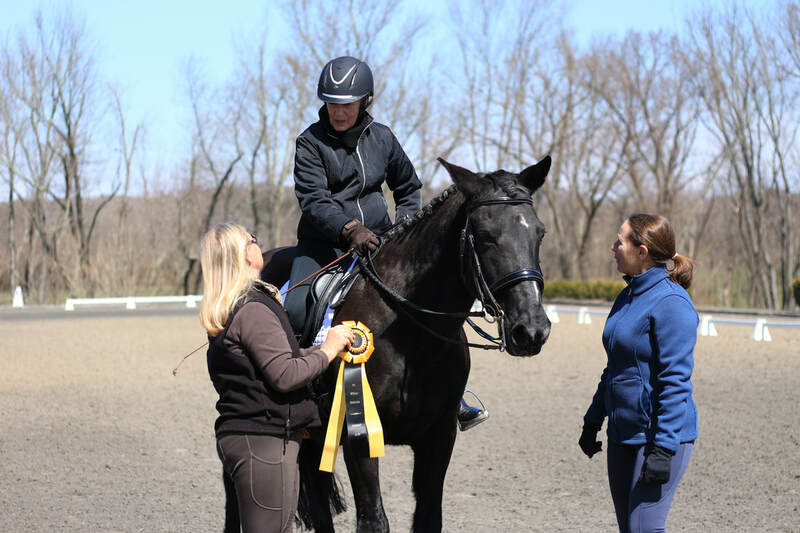 NOTE FROM LESLIE RAULIN: This wonderful story is proof that adult amateurs riding breeds of all types, even with the challenge of rider and horse injuries, can be successful dressage partners, including to the FEI level. Hard work and persistence pays off. There is hope for all of us!